Though it was difficult operating with a small volunteer force, five local veterans came together to form the Central Michigan Veterans Fund (CMVF). The founders are Patrick Birgy, William Cain, Terry Kunst, Brian Rush, and Nick Cononico Jr., from the Vietnam, Desert Storm, Iraq and Afghanistan wars. 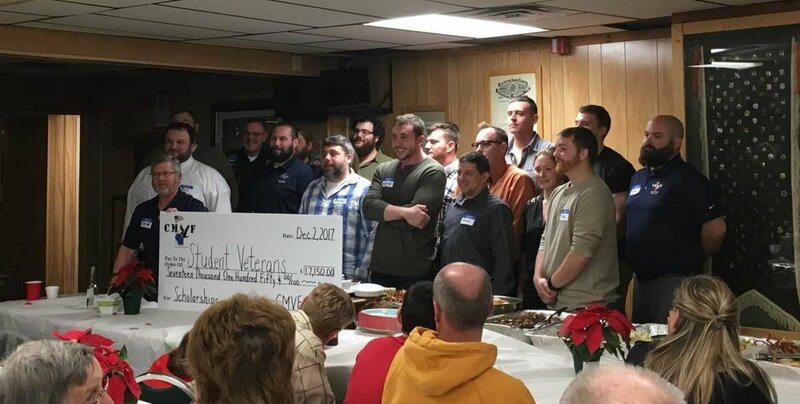 Since CMVF’s inception in 2010, the charitable organization has provided scholarships for veterans and their dependents in the Mid-Michigan area who have served during the global war on terrorism. The organization funds educational and awareness programs, as well as funding campaigns in the Mid-Michigan area on issues that pertain to the difficulties of re-integration back into civilian life. The organization also hosts an annual golf outing on the Saturday before the September 11th anniversary. They have provided 95 scholarships totaling over $65,000 to students at Mid-Michigan Community College and Central Michigan University, area high school dependents of veterans, and currently serving military personnel within their service areas of Clare, Gratiot, Isabella and Mecosta Counties. In December of 2017, the organization decided to place some of the proceeds from their most recent golf outing into an endowment fund that will continue to grow. The donor advised fund will support the efforts of organizations in Isabella County that serve military veterans. The Directors of the Central Michigan Veterans Fund shall serve as the advisors to the Endowment Fund.